The Rae Fawcett Simulation Centre, located in the Clinical Services Building at RIH, is providing the local medical team and students with a new level of health care training. The Simulation Centre is designed to look and function like a real patient room in the hospital with the same equipment and tools available to care for patients. 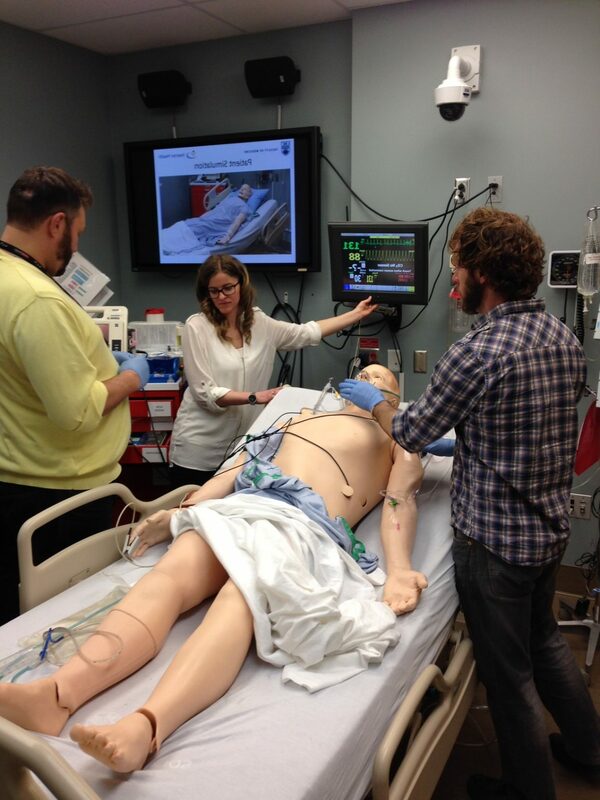 State-of-the-art patient simulators are used to make the training scenarios as realistic as possible. 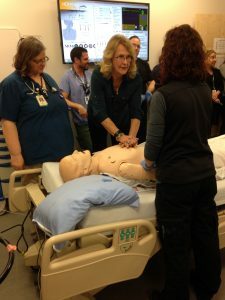 Controlled by the trainer from a separate room, the simulator “patient” can talk, breathe, accept medication and will react to treatment accordingly. A large monitor on the wall shows the simulator’s vitals to the team so they know how their patient is doing. The Simulation Centre opened in 2016 with two simulators: an adult patient named “Alex” as well as a pediatric doll known as “Casey”. Since then, two additional simulators have been added: a pregnant simulator, “Victoria”, who can give birth as well as a smaller resuscitation doll “Annie” who can be transported to different areas of the hospital with ease to practice CPR and even mock codes. The simulators all provide users with a score on their CPR delivery and feedback for improving CPR. This is critical to patient care, as evidence has shown that high-quality CPR and early defibrillation are key to saving lives in a cardiac arrest situation. “When you put it all together and you’re at the bedside, that’s where the learning really takes place. This is 100 per cent authentic. This is exactly what it feels like when you’re at the bedside.” Dr. Steve Reid, RIH Hospitalist who recently graduated from family practice resident training at RIH.